Coming to The Queen via the collection of Queen Victoria, these earrings feature an emerald drop in a thick diamond frame with a bottom trim of articulated diamond fringe. A single diamond stud and a petite diamond bow sit at the top of each earring. According to Leslie Field's book The Queen's Jewels, they were bought in April of 1850 by Victoria and left to the Crown in her will. A jewel-encrusted Queen Alexandra used both of them as pendants, suspending them from two of Queen Victoria's Bow Brooches, and pinned them at the bottom of her skirt for her coronation with husband Edward VII in 1902. 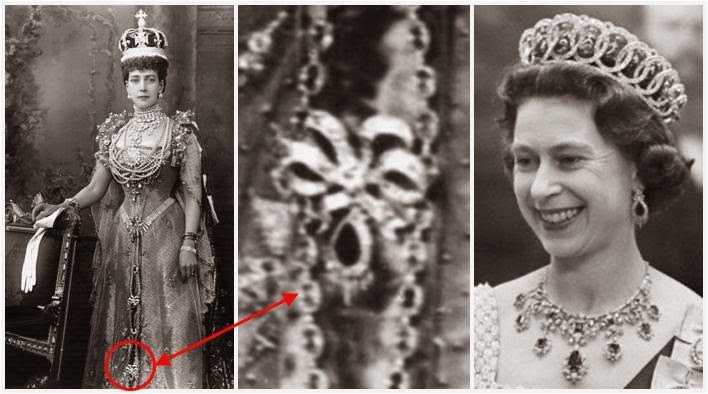 They likely passed to The Queen with most of the rest of the Crown heirlooms when she came to the throne in 1952, and she has worn them occasionally (particularly in combination with the Godman Necklace).